Seems this whole Show Offs Art thing the Beautiful Bride kicked off a little more than a year ago is the real deal. She now has products in over 400 stores across the country. And just this week, we began the move from our FOUR storage units to a warehouse. Or at least a corner of a warehouse. 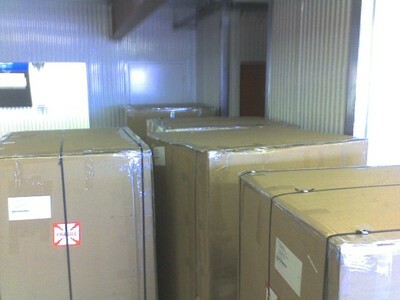 with a real place to pack and ship and pretend like we are a big company. So last week for the first time I said, "I'm going over to the warehouse. "That is something I was pretty sure I would never sat. But frankly, it felt pretty good to say it…(now if they'll just let me drive the forklift." DaySpring, the inspirational division of Hallmark, is featuring one of Show Offs Art products on their website and an email promotion this month. The item they are featuring, Heart and Globe springs from a piece Suzie painted for me. And so I am doubly proud of Suzie and The Beautiful Bride today. As you begin thinking about Christmas shopping, please consider Show Offs Art. Sometimes the inspiration behind a piece of art is as important as the art itself. We find a lot of our inspiration in our children. In our desire to find a fun and inviting way to have Scripture around the house, we developed the magnetic boards as a way to "show off" the things that are important to us…our family, our faith, our friends. We worked with Holly, an amazingly talented artist friend, to develop the line of canvases. 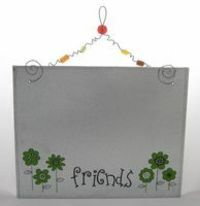 Again, the purpose is to bring Scripture (and a little bit of whimsy and fun) into homes in a bright and colorful way. The story behind our "Heart and Globe" piece sums up who we are as a family, and also what we do as a company. Madison Atwood is a mentally and physically disabled 11-year-old girl who lives in Brentwood, Tennessee. 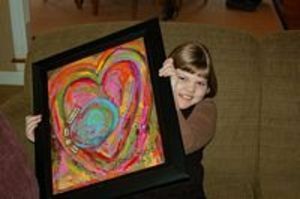 For Christmas 2006, Madison’s mom decided that Madison would paint a picture of a heart as a gift for her dad. An artist friend, Holly, outlined a heart in pencil. She gave Madison the paint brush (one color at a time) and Madison started to trace the outline in lots of bright colors. When Holly gave Madison the turquoise colored brush, she turned her back for a second and Madison colored a big circle over the heart! We initially thought the painting was ruined. But as we looked a little closer, it became clear that the “big blob” was the globe, and the whole image was an example of how big God’s love is for our world. Our daughter Madison’s “Big Heart, Little Globe” has now become the inspiration for our John 3:16 Heart and Globe print. Now, when Madison sees her picture, she says, “Our world is so small but God’s love is so BIG!” What a wonderful reminder! Show Offs Art is moving on up. As of this week, we have products in Lifeway Stores all across the country. So from the beginning of the year we have gone from products in ZERO retail stores to now around 350 stores. 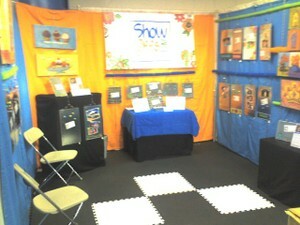 We’re at the America’s Mart in Atlanta, spreading the Show Offs Art gospel. Amazing to see how far we’ve come in a few months. From just an idea that The Beautiful Bride had to already having products in 200 stores. 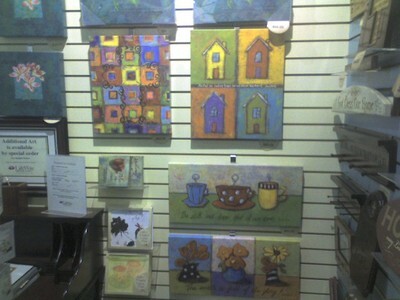 The two new Show Offs Art canvases are in. Everything we do is made in America; the canvases are printed in Chicago, stretched in California, and we store and ship from Tennessee. You can be among the first to have "I Wish Everything Had Chocolate On It" and "Looks Like A Six-Cup Morning" in your home by ordering at the Show Offs Art website. Bloggy Giveaways is giving away some free Show Offs Art stuff. Go here, leave a comment and you could win some cool swag. One of the reigning queens of the blogosphere, "Boomama" is giving away some Show Offs Art stuff. Just run on over to her site and comment and you’ll be entered to win. The What on Earth catalog has picked up a couple of pieces from Show Offs Art. They are featuring No Dinner Until You Eat Your Dessert now, and Everything Is Better With Icing On It will be in the catalog this summer. Last minute shopping for mom…Show Offs Art has some unique (and affordable) art and magnetic boards perfect for your mom. I do not like food that explodes in my mouth.